Indications: Antibiotic used to treat bacterial infections. Summary Recommendations: Erythromycin is used as an antibiotic treatment for certain bacterial infections. It is extremely important to take the full dose of medication as prescribed. There is a good chance your symptoms will lessen and possibly disappear during the first few days of treatment, but this does not indicate the infection is cured. If you stop taking the antibiotic before finishing the full course the infection could recur. Other names for erythromycin include EES, Ery-Tab, Ery-Ped, Eryc, Erythrocin, and PCE. General Precautions: Erythromycin is generally considered safe for use during pregnancy. If you have liver disease or if you suffer from myasthenia gravis, you should tell your doctor before starting treatment. Erythromycin may interact with other medications so tell your doctor about all prescription, over the counter and herbal remedies you are taking before starting treatment. This antibiotic will not cure viral infections, so you should not take erythromycin for the flu or cold symptoms. The drug may cause you to be hypersensitive to sunlight, increasing your risk of sunburn. You may experience diarrhea when taking this drug, but do not use over the counter medications to stop diarrhea. Contact your physician if diarrhea develops. If you are pregnant, tell your doctor before starting erythromycin. There are no known birth defects associated with the drug. 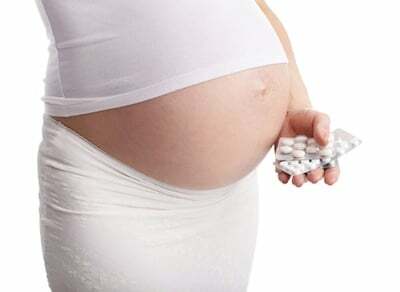 Some of the side effects of taking erythromycin may mirror common pregnancy side effects such as nausea, vomiting, and dizziness. Tell your doctor if you experience any of these side effects. Effect While Trying to Conceive: There are no known negative side effects associated with taking erythromycin when trying to conceive. Fertility does not appear to be affected. Effects on Pregnancy: There are no clinical studies proving negative side effects or birth defects associated with taking erythromycin. A small amount of the drug does pass through the placenta but causes no ill effects. Safe During Breastfeeding: The American Academy of Pediatrics says erythromycin is safe for use when breastfeeding. The drug does pass to the baby in milk so tell the prescribing physician that you’re breastfeeding before starting treatment.